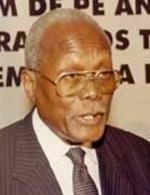 Info Holden Álvaro Roberto (born on January 12, 1923) founded and led the National Front for the Liberation of Angola (FNLA) from 1962 to 1999. He is currently writing his memoirs. Roberto, son of Garci'a Diasiwa Roberto and Joana Lala Nekaka, was born in São Salvador, Angola. His family moved to Léopoldville, Zaire in 1925. In 1940 he graduated from a Baptist mission school. He worked for the Belgian Finance Ministry in Léopoldville, Bukavu, and Stanlyville for eight years. In 1951 he visited Angola and witnessed Portuguese officials abusing an old man, inspiring him to begin his political career. Roberto and Barros Necaca founded the Union of Peoples of Northern Angola, later renamed the Union of Peoples of Angola, on July 14, 1956. Roberto, serving as UPNA President, represented Angola in the All-African Peoples Congress of Ghana which he secretly attended in Accra, Ghana in December 1958. There he met Patrice Lumumba, the future Prime Minister of the Democratic Republic of the Congo, Kenneth Kaunda, the future President of Zambia, and Kenyan nationalist Tom Mboya. He acquired a Guinean passport and visited the United Nations. Jonas Savimbi, the future leader of UNITA, joined the UPA in February 1961 at the urging of Mboya and Kenyan Prime Minister Jomo Kenyatta. Later that year Roberto appointed Savimbi Secretary-General of the UPA. The National Security Council of the U.S. government began giving Roberto aid in the 1950s, paying him $6,000 annually until 1962 when the NSC increased his salary to $10,000 for intelligence-gathering. Roberto met with United States President John F. Kennedy on April 25, 1961. When he applied for aid later that year from the Ghanaian government, President Kwame Nkrumah turned him down on the grounds that the U.S. government was already paying him. Roberto merged the UPA with the Democratic Party of Angola to form the FNLA in March 1962 and a few weeks later established the Revolutionary Government of Angola in Exile (GRAE) on March 27, appointing Savimbi to the position of Foreign Minister. Roberto established a political alliance with Zairian President Mobutu Sese Seko by divorcing his wife and marrying Seko's sister-in-law. Roberto visited Israel in the 1960s and received aid from the Israeli government from 1963 to 1969. Savimbi left the FNLA in 1964 and founded UNITA in response to Roberto's unwillingness to spread the war outside the traditional Kingdom of Kongo. Zhou Enlai, Premier of the People's Republic of China, invited Roberto to visit the PRC in 1964. Roberto did not go because Moise Tshombe, the President of Katanga, told him he would not be allowed to return to the Congo. In 1976 the MPLA defeated the FNLA in the Battle of Dead Road and the FNLA retreated to Zaire. While Roberto and Agostinho Neto's proposed policies for an independent Angola were similar, Roberto drew support from western Angola and Neto drew from eastern Angola. Neto, under the banner of nationalism and Communism, received support from the Soviet Union while Roberto, under the banner of nationalism and anti-Communism, received support from the United States, among other countries. Roberto staunchly opposed Neto's drive to unite the Angolan rebel groups in opposition to Portugal because Roberto believed the FNLA would be absorbed by the MPLA. The FNLA abducted MPLA members, deported them to Kinshasa, and killed them. In 1991 the FNLA and MPLA agreed to the Bicesse Accords, allowing Roberto to return to Angola. He ran unsuccessfully for President, receiving only 2.1% of the vote. The FNLA won five seats in Parliament but refused to participate in the government. Roberto is a direct descendant of the monarchy of the Kongo Kingdom.